15 Creekside View Drive #54, Asheville, NC 28804 (#3413468) :: Robert Greene Real Estate, Inc. 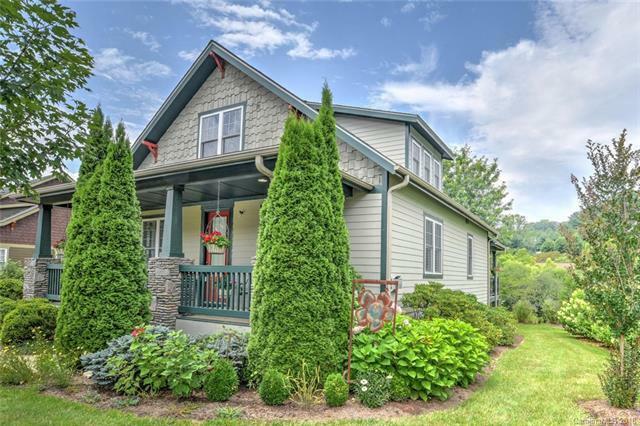 Located on a choice lot in a top Arts & Crafts neighborhood North of Asheville, this single family home has both privacy & community. The covered Back Deck faces a small community wild-life preserve while front porch allows conversation w/ neighbors walking by w/ their dogs. The Villager floor plan is the only one of its kind in the development w/ its 9-foot ceilings on the main floor & 8-foot ceilings on the 2nd. The Kitchen, DNRM, LVRM, Powder room, laundry, MASTER BEDROOM/BA make up the MAIN floor Living. Plus 2 full BDRM's, one large Bonus RM, 2 full Baths & Landing RM will amaze you w/ its spacious 2nd floor. Double garage w/ storage closets & shelves has a back door equipped w/ a doggie door, leading to a partial fenced-in yard. The neighborhood's community center holds regular social events & has an outdoor grilling patio, swimming pool, & fitness room. The property is 15 minutes from downtown Asheville - close to UNCA's Ollie Retirement Center & fabulous Asheville itself! Sold by Hi-Alta Real Estate.